Irina Freguia is the lovely lady running the Vecio Fritolin, one of Venice’s most solid and better eating destinations. In a city not famous for a plethora of fine dining choices, the best option for the savvy wine loving sybarite is to eat in one of the better bacari (bacaro is the name for the Venetian osteria) or family run restaurants that are never about glitz but always about fresh local ingredients cooked expertly in a down to earth, and at times even dowdy, environment. Unfortunately, you’ll find that most of these very fine eating establishments are removed from the main downtown area just around St. Mark’s square, which makes them somewhat inconvenient to reach for families with small children, given Venice’s maze of small alleys, bridges, stairs and canals. On the other hand, once there, you’re almost assured of spending your time in the company of Venetians and Italians only, far away from the madding tourist crowds. 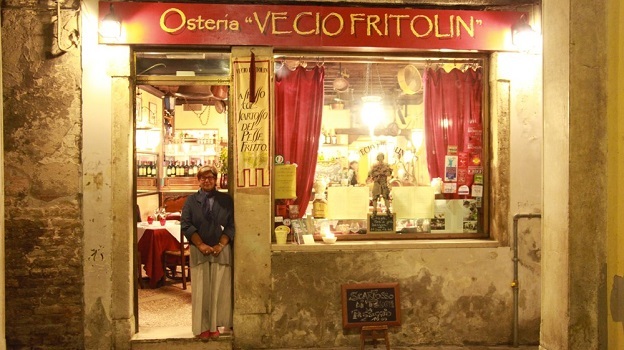 The Vecio Fritolin has been open for business since 1700 and its name derives from the fritolini, those locales where people could stop by and acquire freshly fried fish, still today a staple of Venice’s cooking. My meal in Vecio Fritolin’s slightly dark and decidedly antique interior was uneventful and satisfying. The fish fry, served in the typical paper cone is, by all accounts, if not the best, then one of the top five in the city, and the seafood salad was also expertly prepared and very rich in diverse fish, mussel and crustacean species. I washed down the crisp, precise fried fish flavors with the 2013 Ribolla Gialla from Valentino Butussi, a producer who is remarkably adept at turning out lovely, easy drinking but flavorful wines from this underrated grape variety. Though not the last word in concentration or complexity, Butussi’s Ribolla is always a sure bet as an aperitif, given its lively acidity and its bright aromas and flavors uncompromised by oak or excessively long maceration times or aging in amphorae or other weird stuff that many producers have been busy subjecting poor Ribolla Gialla to of late. My ink squid pasta was one of the best such dishes I have tried in the last few years, its concentrated saline clout matching heavenly well with the deep, rich and very saline 2010 Orto di Venezia. This unique wine is made by Frenchman Michel Thoulouze on Sant’Erasmo, an island in the Venetian lagoon, where winemaking has centuries old history. A blend of 60% Malvasia Istriana, 30% Vermentino and 10% Fiano, it’s intensely mineral, herbal and classically dry, showcasing above average complexity and depth. My very satisfying lunch ended after a delicious and light lemon dessert featuring extra virgin olive oil as well as lemon, but my time at Vecio Fritolin didn’t end there. It continued on unhurriedly, as I simply sat there reading my Italian sports newspaper while sipping on the NV Raboso Passito by the Cecchetto estate, without doubt the best producer of Raboso Piave wines, both dry and sweet. This Passito is made with air-dried grapes and is not unlike a Recioto della Valpolicella, so I could have easily paired it with, among many other valid potential choices, a chocolate dessert or an aged blue cheese, had I been so inclined. However, just sipping the Passito on its own really did seem like a rather civilized and very Venetian way of wishing the gently warm, setting afternoon sun a very fond goodbye.